Ignorant comments like these totally disregard all the excellent ports the Jaguar has of classic games such as Sensible Soccer, Raiden, Worms, Rayman, Flashback, Doom, Wolfenstein 3D and Pinball Fantasies. In fact in many cases these ports represent the best version of the game released for a console at that time. But we are not here to talk about ports are we? What you want to know is what great exclusives does the Jaguar have? 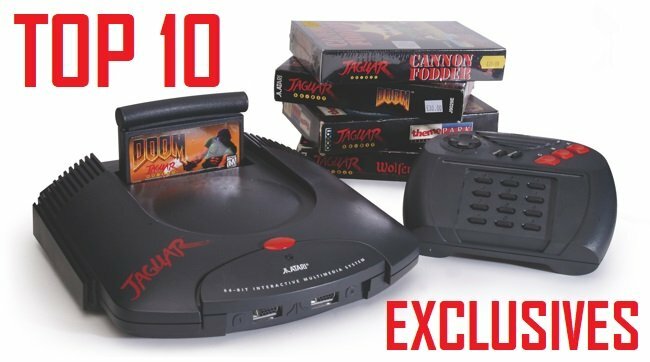 You’ll be pleased to hear that it has plenty, so let’s countdown ten of the best available for the standalone Atari Jaguar (no CD games). Oh, and before you ask, yes the Jaguar is definitely 64-bit. I hope we cleared that up now! Ok, so let’s get the most obvious one out the way first – the game that many call the Jaguar’s “Killer App” Rebellion’s Alien Vs. Predator. And before anyone mentions it, no it wasn’t ported to the PC, that game was actually the sequel to this one. I find that AVP is often described as a FPS and I have always had a big problem with this as, while it appears to be that type of game in style, it’s really more of an adventure game and a survival horror. This is because the key element of the game is not always killing (depends how you choose to play it) and is more about surviving and completing your mission. In AVP you get to choose to be the Alien, Predator or the Marine and each one has their own individual storyline that also involves the other two characters, the game plays differently depending on which one of them you choose. For me this game is still every bit the same scary and atmospheric experience that it was back in 1994 when I very first played it with some genuine jump out your seat moments. So stick it on, turn off the lights and try to stay alive as long as you can! This aftermarket game was picked up by official third party publishers Telegames after being unreleased by Atari back in the day. It is based on an Atari STe game of the same name but is actually more of a sequel than a straight conversion (why not Zero 6?). While 3D space shooters are far from rare on this system Zero 5 is very unique in that it manages to mix lots of different styles into the same game. There are first person shooting parts in open space, stages where you race through tunnels at high speed like the arcade game S.T.U.N. Runner and also a 3D take on a traditional space shooter where enemies come at you from all angles. Variety is the spice of life as they say. Both the graphics and sound here really are superb and Zero 5 is one of those games that proves the Jaguar really can do proper 3D in the right hands. There is no doubting this is one of the most technically impressive games on the Jaguar and really shows what the machine can do in the right hands. But be warned, because this bad boy is pretty bloody hard.